hey, everyone! time for another field report. 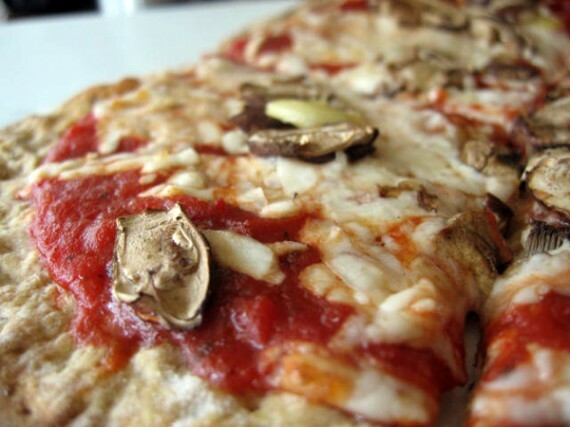 this one comes to us from jessica of Bein’ Green Savin’ Green (check out her awesome blog), and she’s lettin’ us in on some vegan options in delray beach, florida. here we go! 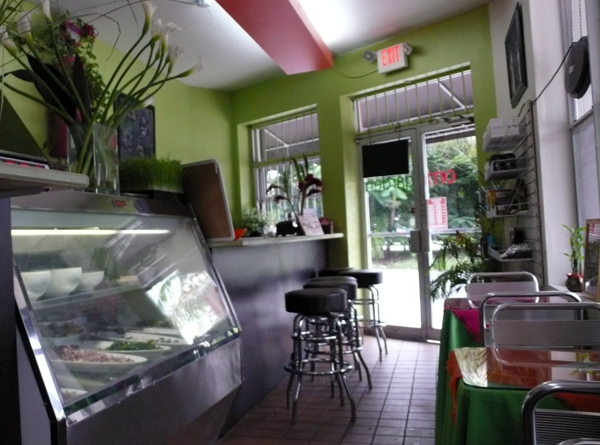 On my visit to Delray Beach, Florida to see my grandma, we struggled to find enough vegan-friendly restaurants and thus ended up frequenting a café called The Green Gourmet. The cute café was nestled in an upscale strip mall and seemed a little out of place next to heavily meat laden Italian restaurants. 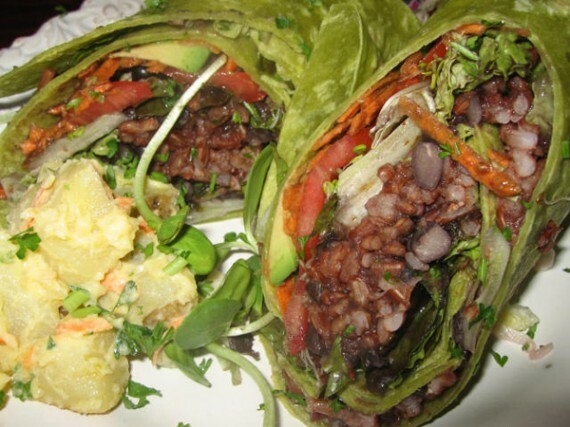 The primary focus of Green Gourmet is to offer fresh, healthy and delicious organic food. My grandma and I inquired which of the menu options were vegan and the man, who appeared to be the manager, answered that many of their dishes were vegan or could easily be made vegan. We opted to sit outside and enjoy the Florida sunshine. I was a bit surprised that the outside tables were covered in a fancy white tablecloth, but I guess this was reflective of the expensive menu items. I decided to order a half order of the Organic Veggie Lasagna ($6) along with the Mashed Cauliflower side. My grandma wanted something simpler and chose the Veggie Burger. 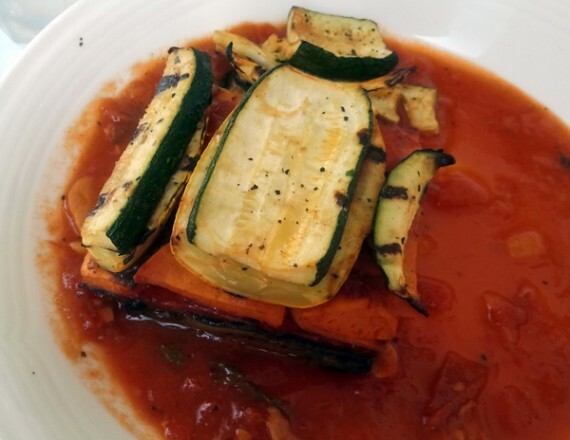 The Organic Veggie Lasagna was very good. I had no idea it was possible to make such a delicious dish with just vegetables! Nevertheless, the vegetables were layered in a way that made me not even notice the dish lacked noodles. 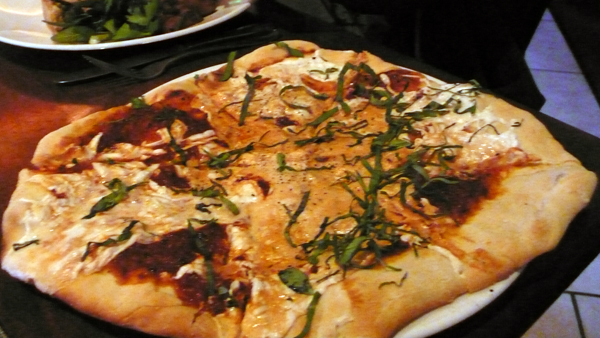 The vegetables were very well cooked and seasoned and the tomato sauce was sweet enough to contrast the savory spices. Each vegetable was soft but had a slight crispiness to it. field report time! 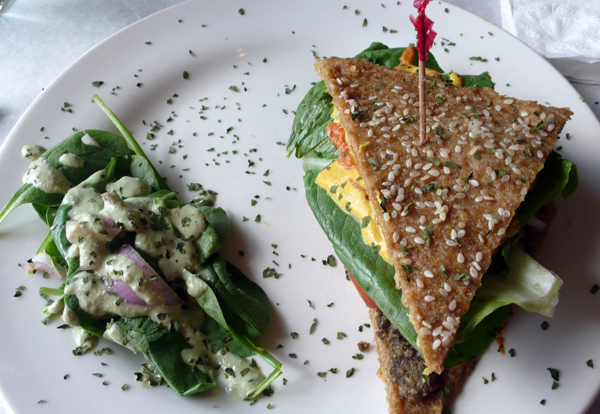 kris from veganscraps sent us another guest post, and this time she checked out chef brooke’s natural cafe in fort myer’s, florida. brittany has covered chef brooke’s on this blog in the past, and this review is definitely making me wanna go there even more. from what i hear, florida’s vegan options aren’t as numerous as they are here in los angeles…so it’s great to know when good quality food is available. Normally when someone mentions Florida you begin to think of palm trees, the beach and the warm weather (which are all accurate descriptions)… but when I think of going to FL (specifically Fort Myers), one thing comes to mind “Chef Brooke’s Natural Cafe“. 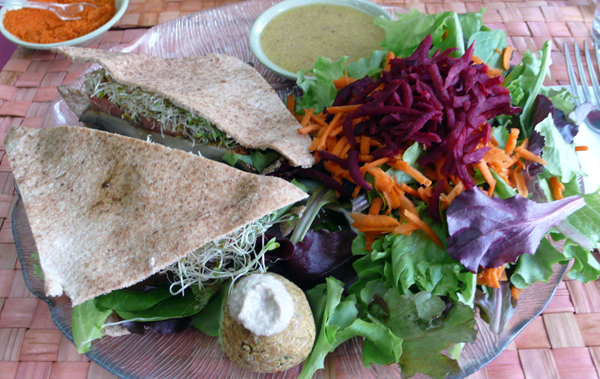 This Cafe is my favorite healthy cafe on the planet! The owner and chef, Brooke is extremely talented at cooking food as well as presenting it beautifully! 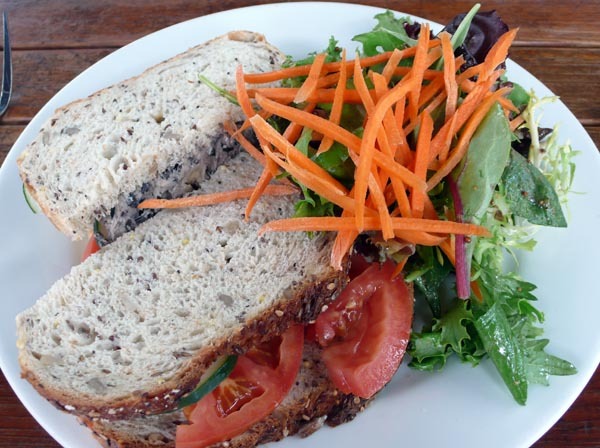 Chef Brooke’s Natural Cafe offers a HUGE menu (not 100% vegan, but most items are or can be made vegan) with smoothies, baked goods, daily specials, raw and gluten free food, burritos, veggie burgers, hummus platters, soups, and a small grocery area to pick up little extras! hey everyone! time for a vegan field report. this one comes to us from all the way across the country in west palm beach, florida. 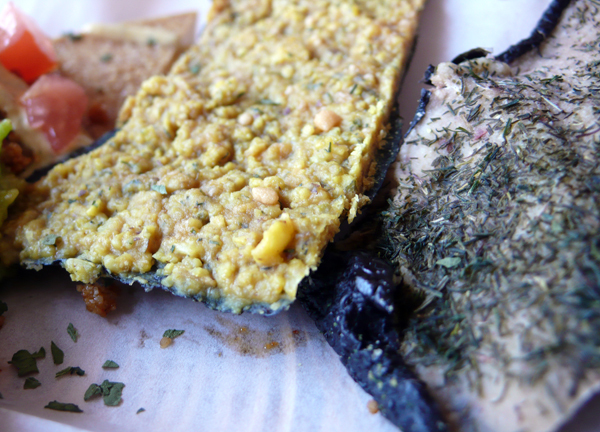 check out chicavegan’s review of darbster! Last week, I went to South Florida to visit my family there before the Holidays and for my little sister’s 18th birthday. 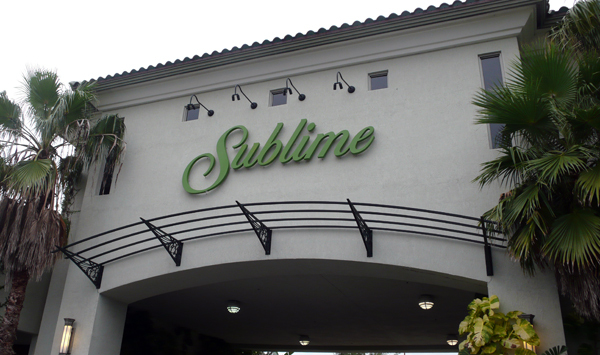 I had already dined at Sublime before, and Miami is a little too far for me, so I decided to go up to West Palm Beach to try “Darbster” for the first time, a dog-friendly restaurant, tucked away from the busy Dixie Hwy. My older brother and younger sister came along; neither of them are vegan, and were quite curious and intrigued. after a nice relaxing day on sanibel island, my folks and i stopped at pizza fusion in fort myers for some grub. my adorable mom was really excited to take me there, telling me during several conversations over the last few months there was a new pizza place with vegan pizza. i’ve been to pizza fusion here in LA, so i was interested to see how the fort myers location compared. happy weekend, folks! it’s time for another vegan field report by brittany from the sick of lettuce blog. 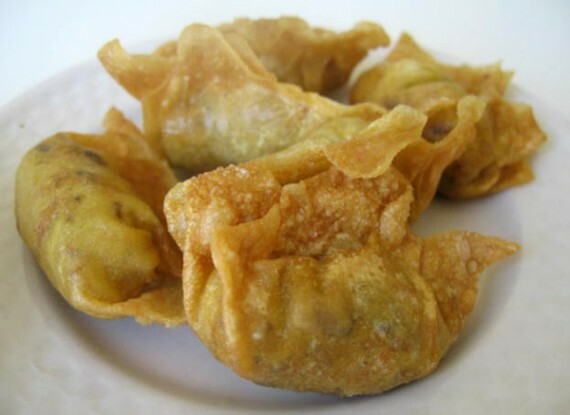 this time she takes on our FAVORITE cult ever (read more about them here) with her review of loving hut’s cape coral location. 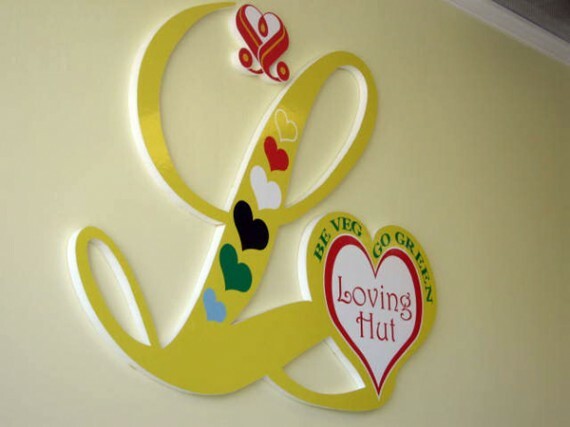 we are huge fans of the food at loving hut here in LA, so let’s see how the florida restaurant stacks up. as i’ve said before, the city my parents live in is pretty thin on vegan options. so imagine my surprise when i found out there was a 100% vegan restaurant in cape coral, fl! 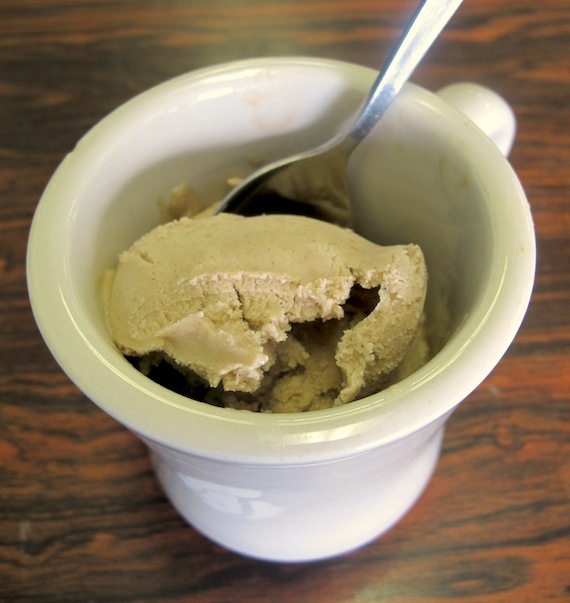 cape coral neighbors fort myers and loving hut is just a hop, skip, and a toll bridge away. i’ve never been to the loving hut here in LA but i have heard good things. it’s not one of those crappy vegan thai places! so one day my mom and i drove over the bridge to check it out. i recently took a jaunt down to southwest florida to visit my folks and eat. a lot. unfortunately, the city they live in doesn’t have many restaurants with vegan options (more on those at later dates). FORTUNATELY, my mom is awesome and was willing to drive me 2 hours through the everglades for a day trip to miami, followed up by dinner at SUBLIME in fort lauderdale. since we had a two hour drive back home, we got there promptly at 5:30 and opened the place up. i wasn’t sure what to expect when i got there. it is a LOT bigger than i thought it’d be – way bigger than any of the vegan restaurants here in LA. very upscale and while the dress code is casual, i felt like kind of a bum in my cutoffs. whoops. after ordering my mom and i were quickly presented with some pesto polenta. this was absolutely delicious. 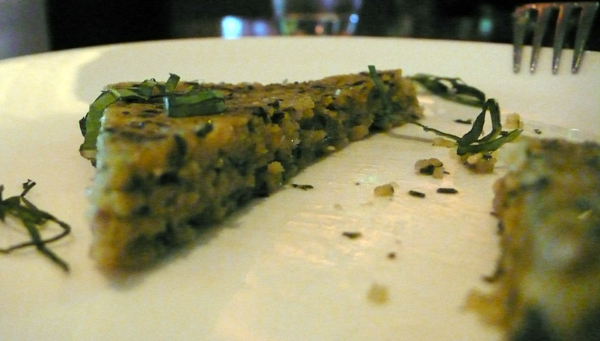 super strong basil/pesto flavor and a great polenta texture. these lasted about 15 seconds before they were completely devoured. i’m usually not a huge fan of raw food. i mean, i’d like to be—i understand how healthy, sustainable and wonderful it is…but it’s usually so expensive and something about it doesn’t taste quite right. 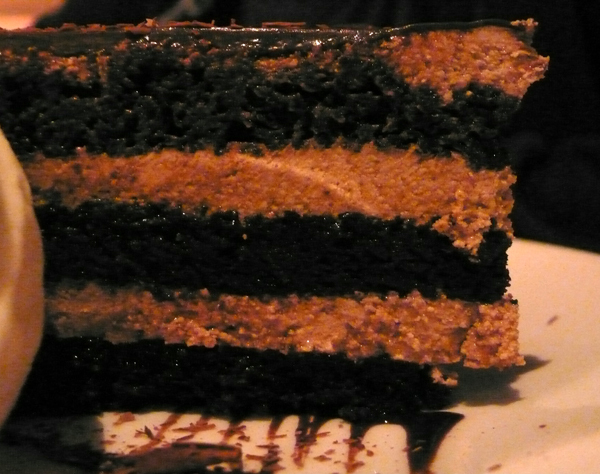 juliano’s and leaf are great every once in awhile, but in my book they are just no substitute for “normal” food. that being said, i was a little skeptical before trying lifefood gourmet in miami, an all raw restaurant that on their website describes their meals as “culinary masterpieces.” but after eating there, i can tell you their description is an understatement. this was without a doubt some of the best food i’ve ever had, raw or otherwise, and i would eat it every day if i had the chance. we started our meal off with the lifefood sampler and it was freakin’ incredible! i don’t even know which bit of it was my favorite because it was all sooooo good. 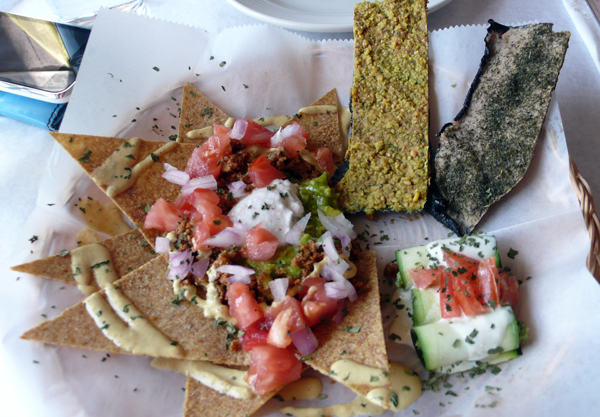 the crazy nachos were insane, so much better than the attempt at “chips,” usually made of flaxseed, that i’ve had at other raw restaurants. these tasted just like really tasty nachos. 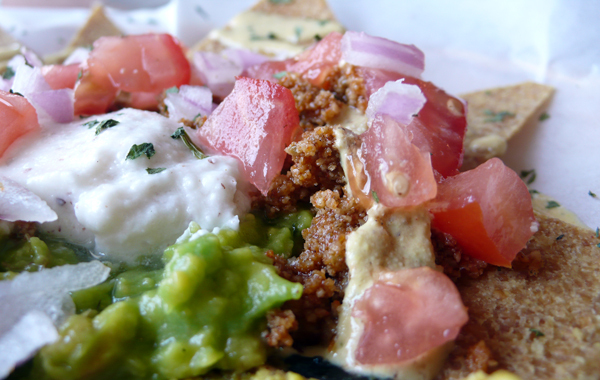 they were topped with salsa, guacamole and fake meat, pine nut cheese and brazil sour cream. perfection. 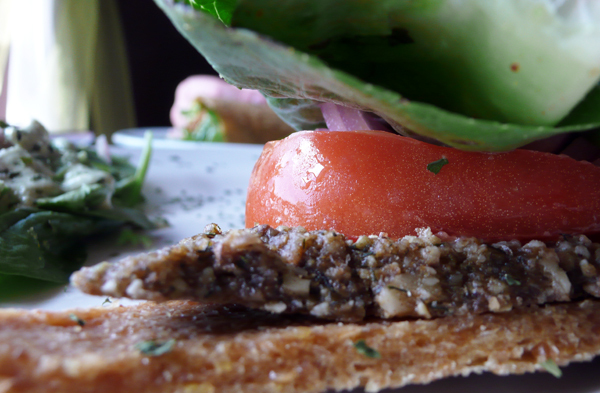 the nori were great as well, topped with a delicious cheese-flavored pate. they were crispy, light and devoured in about 2 seconds. the sampler platter also came with 3 scrumptious little cucumber rolls that were filled with a creamy substance that reminded me of pesto. topped with fresh vegetables and a tasty sauce, these bite-sized rolls were both pretty to look at and delish. as entrees, we decided to go with the life gourmet burger and the lifefood burrito. 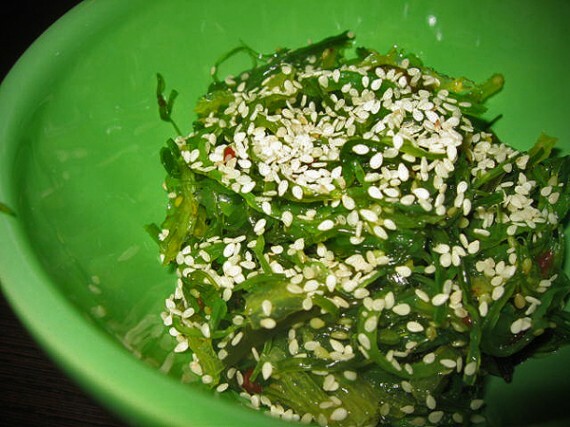 lemme tell ya, these raw dishes give their cooked counterparts a run for their money…and they are phenomenally healthy! i was hesitant to order this burrito at first, because almost always raw “tortillas” are pretty pitiful. i was scared this may show up wrapped in lettuce or something. 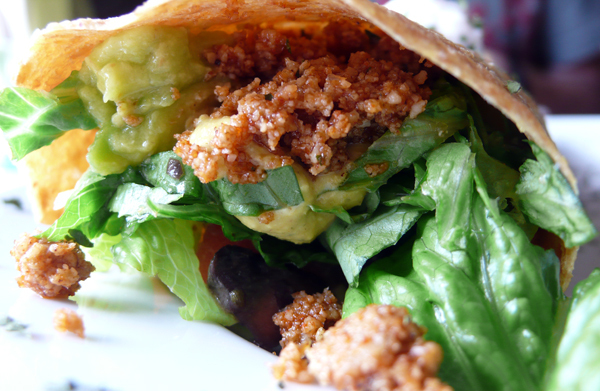 instead, it came in a delicious wrap with a slight sundried tomato flavor and a chewy texture. i was very pleased. the burrito’s innards were equally impressive—the “nutmeat” (haha) tasted like soyrizo, perfectly spiced with a juicy and substantial texture. the pinenut cheddar and guacamole were packed with flavor as well and added a rich taste to the light vegetables and spicy meat. the succulent mushroom was well-marinated—i love that this burrito came with a portobello AND fake meat. i felt totally spoiled. not to be outdone by the fab burrito, the life gourmet burger was even better. i can’t believe this thing was raw! how the hell do they make a bun that tastes so good without cooking it? magical! the bun was thick and spongey, soft and not dry. serious yum. 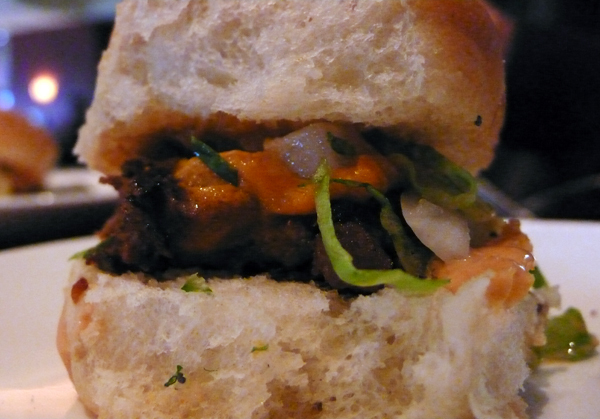 the patty was even better and can only be described as luscious. 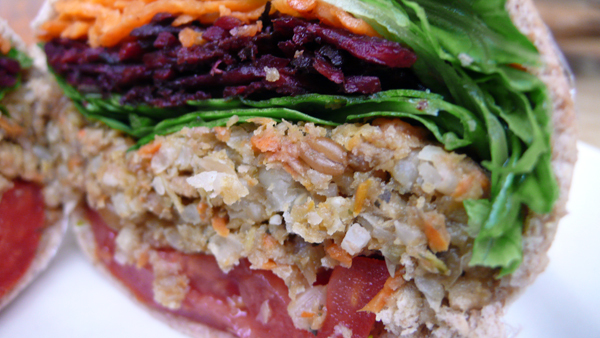 one of the best vegan burgers out there happens to be raw. who’d have thought? 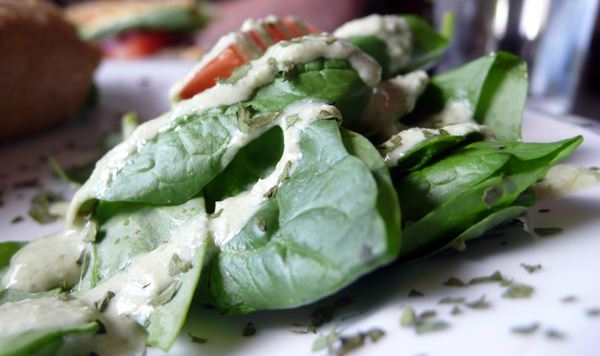 both dishes showed up with a top-notch salad as well—fresh leafy greens slathered in a creamy pesto-flavored dressing. i absolutely loved it. overall, i really can’t speak highly enough of lifefood gourmet. 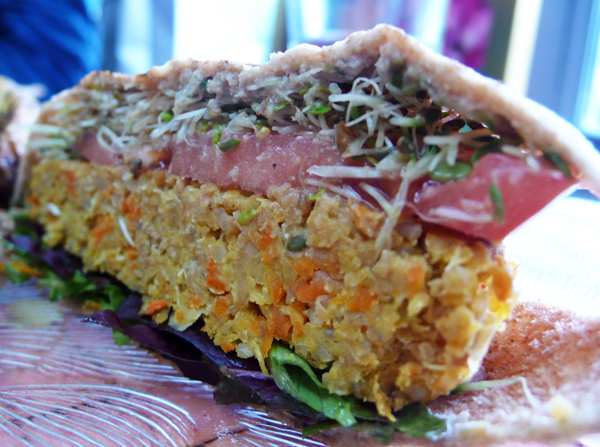 it’s vegan, it’s raw, it’s amazingly healthy, and everything tastes delicious. plus, did you see those pictures? everything shows up at the table so beautifully presented. it’s all almost too pretty to eat. A+ all the way around. the menu is huge as well, i’m pretty disappointed my trip to miami wasn’t long enough to eat at lifefood gourmet several more times! fortunately, they have a recipe ebook online, so i am definitely gonna download it and try to learn some of their secrets. watch out though, the restaurant is a little hard to find because it’s located on top of another great vegan restaurant. 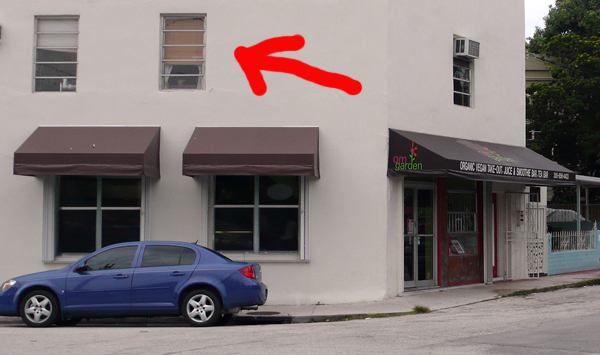 there’s no sign or anything, so just make sure to go in this door and climb the stairs to find your raw vegany heaven. so i don’t know what you are waiting for. if you are in miami, go eat at lifefood gourmet asap…and if you are anywhere else, check out their recipes online. best raw food ever. stay tuned…one more miami restaurant, then we are back to los angeles! 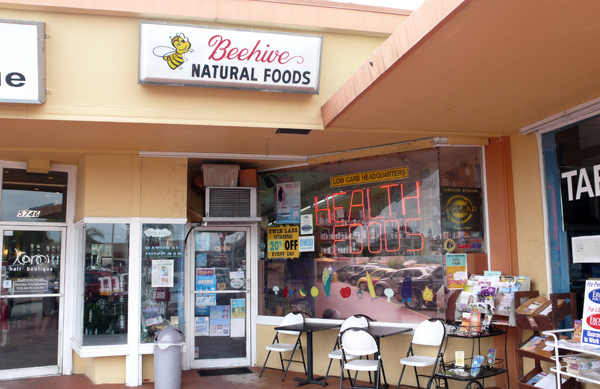 when i headed across the country on my recent trip to miami, there was one place in my mind that i knew i had to check out no matter what: beehive. the happycow and yelp reviews were down right intriguing, describing the place as unbelievable. lex of vegan-la even wrote me an email when he found out i was traveling to florida, urging me to specifically check out beehive no matter what. this place got so built up in my mind, i didn’t know quite what to expect. 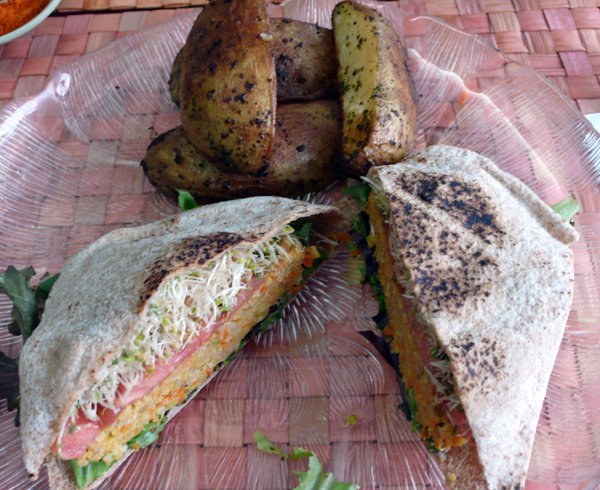 rainforest burger: vegan burger in pita bread with lettuce, carrots, beats spinach and tomato. i knew beehive was a small cafe with just a counter and a few stools located at the back of a health food store…and here just a few of the other things the reviews promised: a friendly and humorous chef who offers up free samples of whatever he’s cooking, a huge rotating menu consisting of tofu, seitan empanadas and soup, and a cramped bustling seating area with a wait. when i arrived on a friday afternoon, the place was empty and i don’t think the chef was even there…just some gruff dude chopping up vegetables who snarled at us as we sat down. i had read on yelp that this place was vegan and maybe even a bit snobby towards omnivores, so i was a little surprised to see jars of honey sitting amongst the condiments. oh well, maybe they just aren’t that strict, i thought. i was looking forward to trying the seitan, and since i didn’t see any specials getting cooked or anything, i just went ahead and ordered off the huge menu board that hung above the counter: 1 tofu sandwich and 1 seitan sandwich. the dude told me they were out of both those things…actually they were out of everything on the menu except tuna sandwiches and veggie burgers. tuna sandwiches, WTF?!?! i thought this was a vegan place…or at worst, lacto-ovo. why the hell is fish 50% of the menu right now?! oh well, i just shrugged it off and ordered the burger…which ended up being pretty damn tasty! the patty was huge, and definitely homemade, which is a plus. the pita was soft and totally overflowing with all the fresh vegetables. not bad. the leafy spinach in particular was especially delicious. also, the dude gave us two huge squezzy bottles of tahini and hot sauce to pour all over our burgers. mmm. mmmm. MMMM! that really hit the spot. so, even though i definitely hit up beehive on a very off day, my journey there had a happy ending: a very respectable vegan burger. i will definitely try to go back some day and hope that the chef is there, i mean the reviews on happycow make it sound way out of this world. they go on and on and on and on about all the different dishes and specials that the chef thinks up each day. even the set menu on the wall was massive, i would have been so content ordering from it, if only they weren’t out of everything! motherfuckers! even as i sat chomping away on my burger, i couldn’t help but notice a bunch of rave reviews of the cafe from local magazines with pictures of all the awesome food, hanging on the wall and mocking me. damn…i wish that chef was there! i will go back next time i’m in miami. hopefully it will be on a good day. 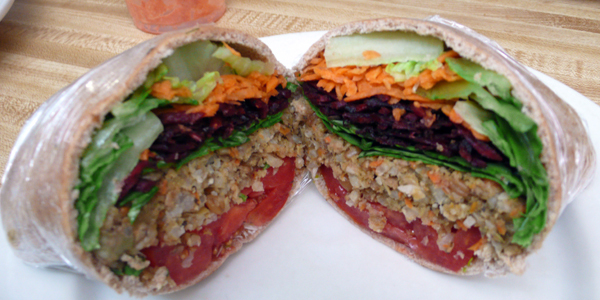 navigating a new city veganwise can be very difficult and miami, FL is no exception. that’s why i rely on trusty sources like happycow and yelp to tell me all the cool meatless places to try out. the husband & i like to eat at as many all-vegan restaurants as we can, just to support them and make sure they stay in business. so when we heard about om garden, we knew we had to pay them a visit. 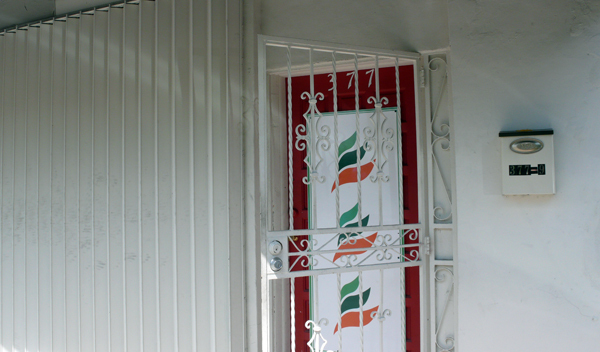 located in downtown miami, om garden was just a short drive away from my beachfront hotel. 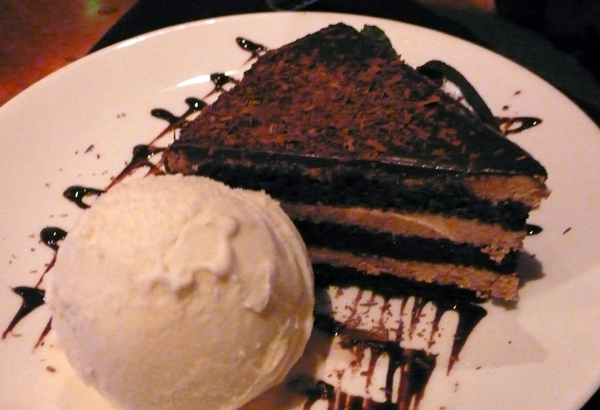 the atmosphere was bright and relaxing, the staff was friendly, and OMG the food was delish. this is one of those places that serves up really great meals that are guilt-free and astonishingly “healthy” tasting. everything is fresh, nothing is greasy, and there is something so light and refreshing about each bite. after eating a vegan burger at most places, i feel like someone has implanted an anchor in my gut. but after the burger at om garden, i felt energized and alive, active and alert. 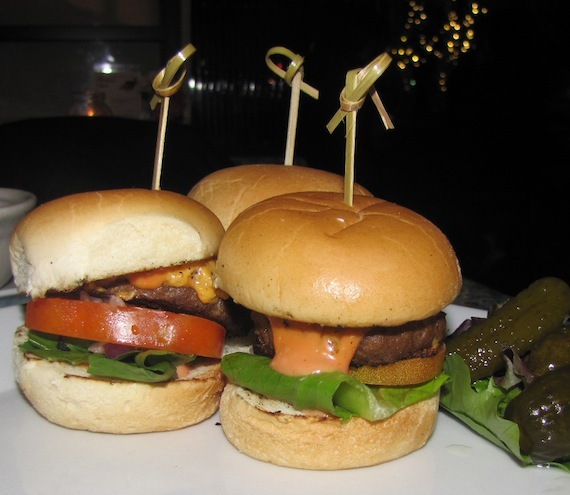 happy cow veggie burger: our house special, served a whole wheat bun with lettuce, tomato, onions, ketchup, mustard and mayo. with roasted potatoes. 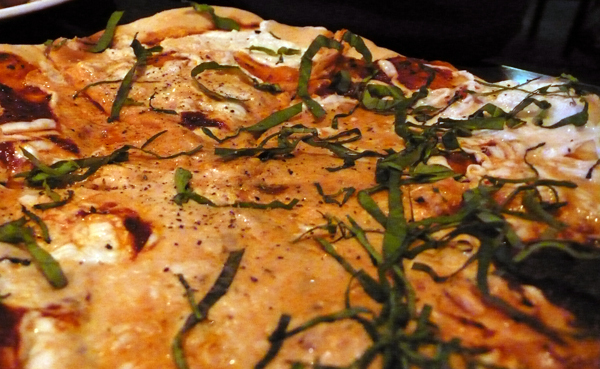 the whole wheat “bun” was actually more like a thin pita pocket, which suited me just fine. 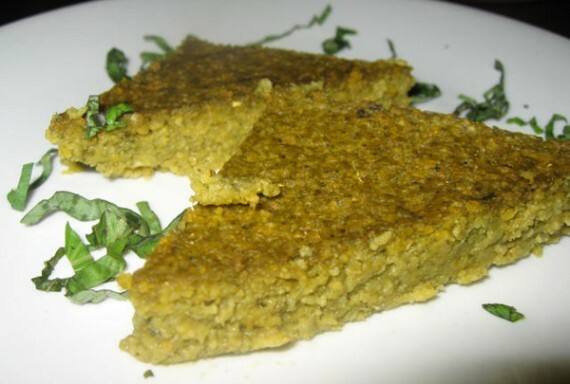 who needs a bunch of thick bread overpowering the delicate tastes of a vegan patty? speaking of the patty, it was superb. vegetables, grains, and other good stuff all mashed together and seasoned perfectly. i don’t remember how much the burger cost, but i think it was around $10. well worth it. especially since i could tell i was eating something made with the finest ingredients. the roasted potatoes were also excellent. bursting with flavor and not too oily, they tasted so good and like they were so good for me. the other entree we ordered was the supersonic sandwich. 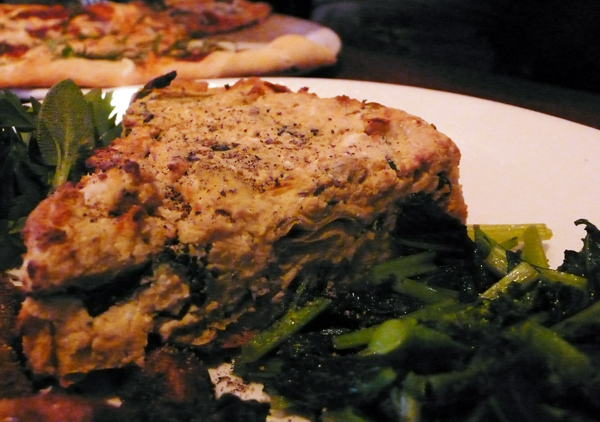 it came with a choice of tofu, tempeh or portabella. in keeping with the healthy theme, we opted for the mushroom. 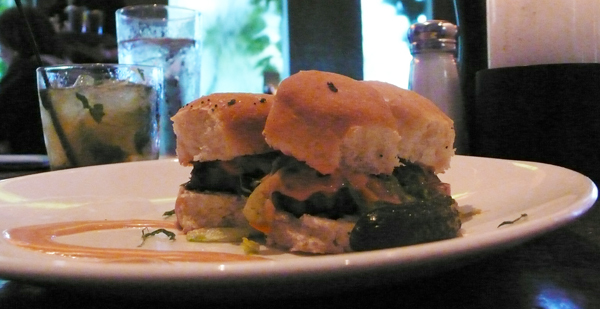 while my favorite was definitely the burger, this sandwich was still scrumptious in its own right. supersonic sandwich: portabella mushroom served on a sprouted grain bun with lettuce, tomato, avocado veganaise, ketchup & mustard. comes with a side salad. 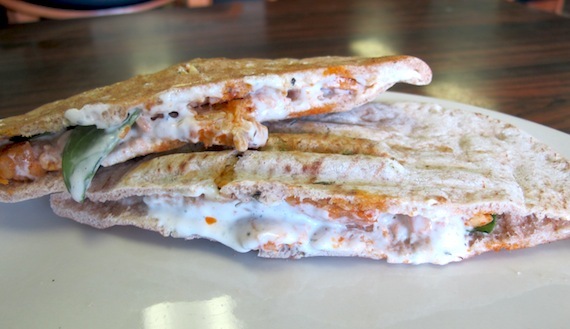 this sandwich was also, i think, around ten bucks and came on a pita instead of a bun. it was great, except it had to be eaten with a fork because the savory sauces and mushroom juices made the pita too soggy to pick up. that doesn’t matter though, it still tasted amazing. the succulent portabella was huge and juicy—who would have thought a plain old mushroom could be such a perfect meat substitute? because i eat everything with hot sauce, i was a little disappointed that om garden didn’t have any. 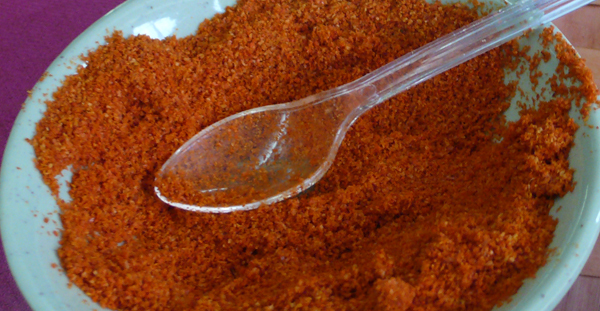 what they did have, though, was a little bowl of hot powder. sprinkled on the sandwich, it totally did the trick, without all the evil sodium that’s packed into my favorite liquid. lastly, i definitely have a penchant for falafel…so when i saw on the menu that om garden sells them by the ball, i had to indulge. 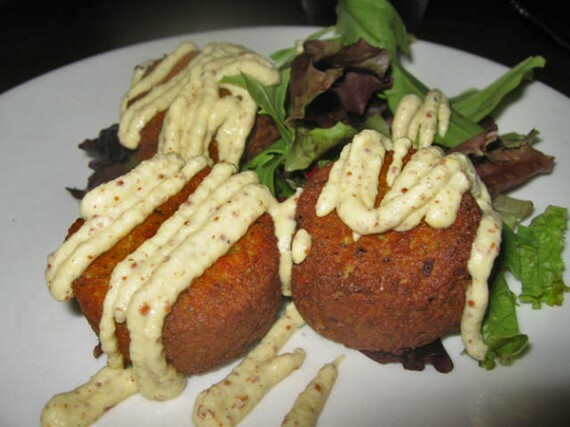 who the hell orders ONE falafel ball? me. and it was gone in one bite. 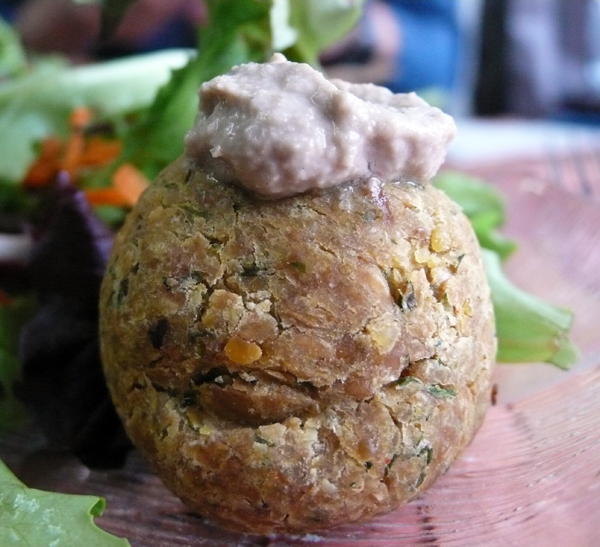 he was a pretty healthy tasting falafel ball, and even came decked out in a little hat made of hummus. doesn’t it look like he’s smiling in the picture. awww. very nice. 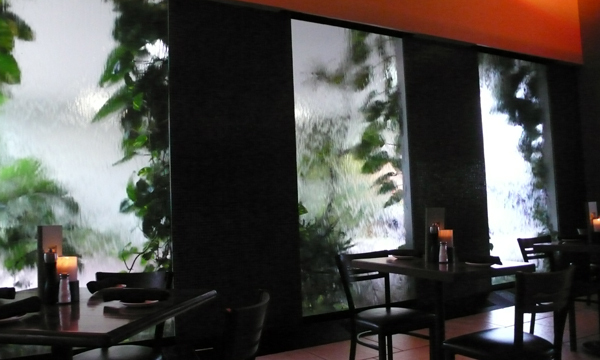 in addition to the tasty food and fresh ingredients, the ambiance at om garden is very pleasant. colorfully decorated with lots of windows that look out on green surroundings, om garden is a great place to relax and enjoy your big plate of vegan goodness. so when in miami, add om garden to your list of places to check out. dine there when you want a light healthy meal, not something decadent. 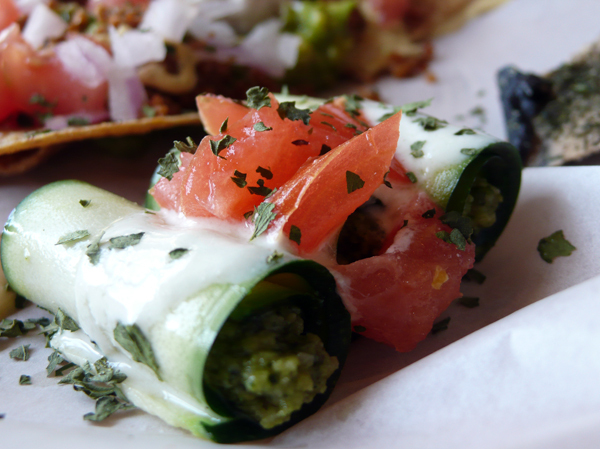 it’s the perfect thing to eat before you go strut your stuff on the beach with all the fit and beautiful locals. recently i took a trip to florida, and in addition to soaking up sun and bobbing around in the ocean, i made it a point to visit as many vegan eateries as i could. over the next few days, i’ll bring you stories of meat-free food from ft. lauderdale, downtown miami, and the beach areas…starting with south beach, which is where i stayed. i did a lot of research before visiting florida on sites like happycow and found that there weren’t really any vegan restaurants near my hotel—i was pretty much resigned to the fact i would have to drive over the bridge to try out the really good places. 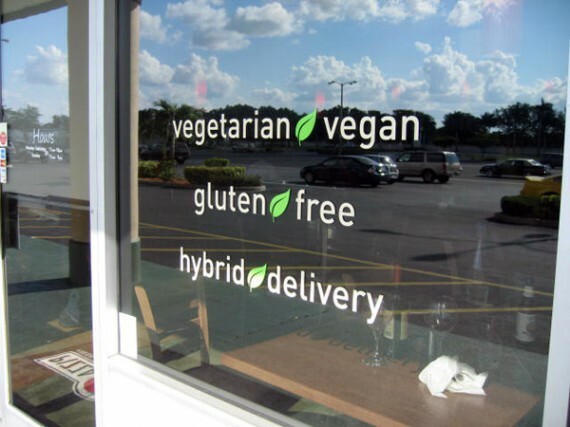 so imagine my surprise when i was walking down lincoln road, a trendy little street of shops and restaurants reminiscent of 3rd street promenade, and spotted a menu propped up on a stand with the word VEGAN clearly labeling an entire list of items. 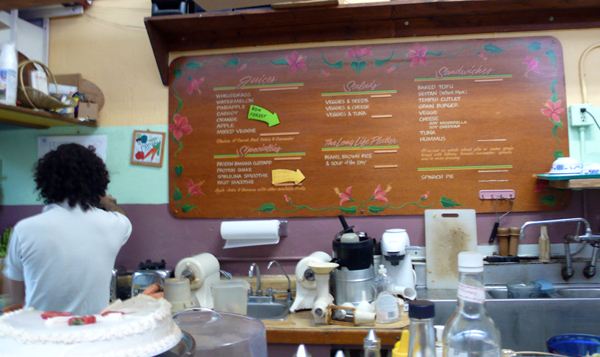 the vegan-friendly menu belonged to books and books, a hip little book store that also functions as a café. of course the husband and i had to try it out. the result was pure delciousness. while the menu had a lot of vegan options, many of them contained bell peppers, which i absolutely hate. 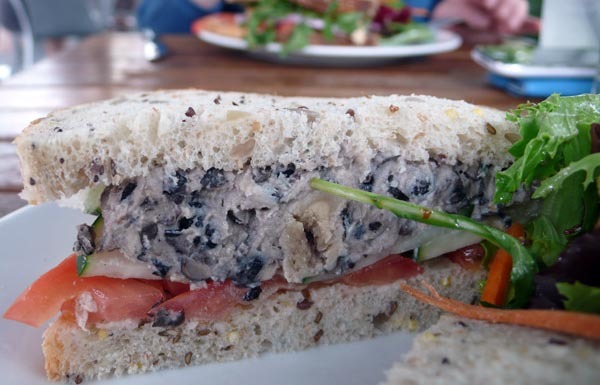 one tasty dish, however, that could be easily made without peppers was the black bean hummus sandwich. black bean hummus sounded way too good to pass up, and i was right…it was soooo freakin’ yummy. i inhaled it in like 4 seconds, but from what i remember, it was pretty damn perfect. the hummus was thick and substantial, not as runny or mushy as normal hummus, so it made for a hearty sandwich filling. the black beans added so much flavor and an unexpected crunchiness to the chickpea puree. 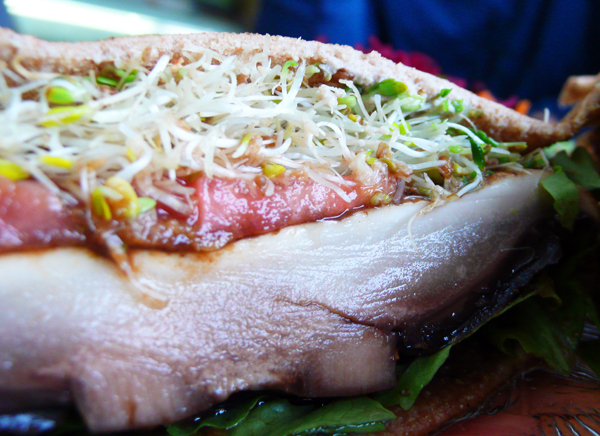 plus, the sandwich was piled high with crispy cucumbers and juicy tomatoes. a very good find. the vegan chicken sandwich was also quite lovely, but definitely not worth $3 more than the hummus sandwich, which i preferred. the fake chicken was nicely grilled, but it did taste like it was probably a frozen patty to begin with. that’s not bad, though, for an omnivorous restaurant in miami beach. i’m just stoked they have vegan options at all, let alone actual fake meat! 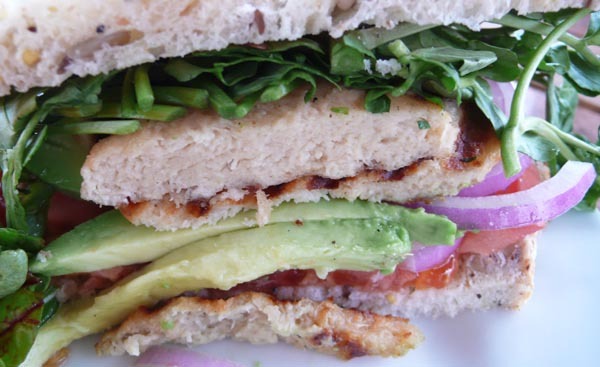 the vegetables were also scrumptious on this sandwich: a big thick slice of avocado, tomato, and mixed greens all added fresh flavor to the succulent little piece of chicken. 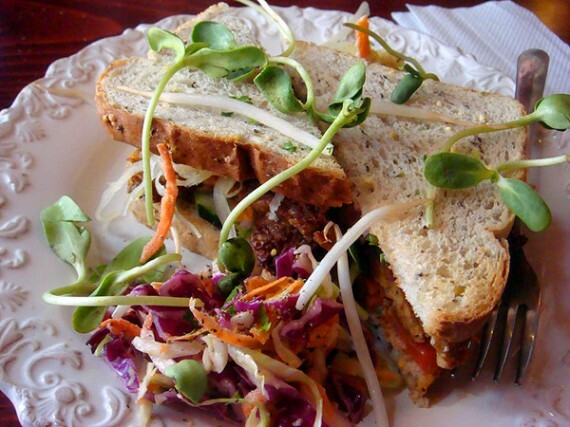 while so many other things on the vegan menu sounded amazing, these sandwiches really hit the spot for quick and satisfying light lunch. the side salad was quite tasty as well, boasting tons of dark leaves, a mound of shredded carrots and a zesty vinaigrette. plus, the sandwiches came already cut in half so they were perfect for sharing. we pulled our favorite trick: ordering 2 and then swapping halves. 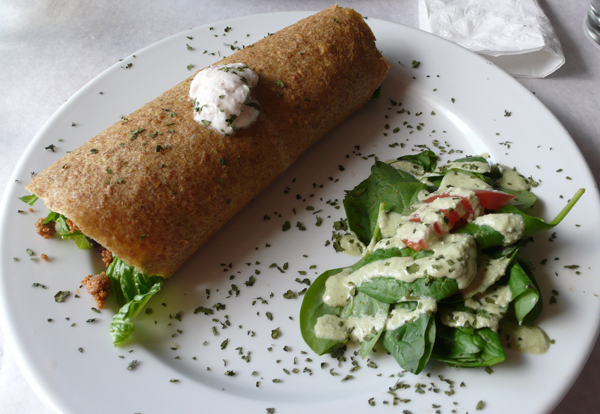 besides the fact that the food is pretty awesome, i urge you to support books and books for boldly dedicating an entire section of the menu to clearly-marked vegan items. it was so lovely to sit in the sun, amongst all the shoppers, in a city with few vegetarian restaurants, eating food i knew to be vegan at a “normal” café. 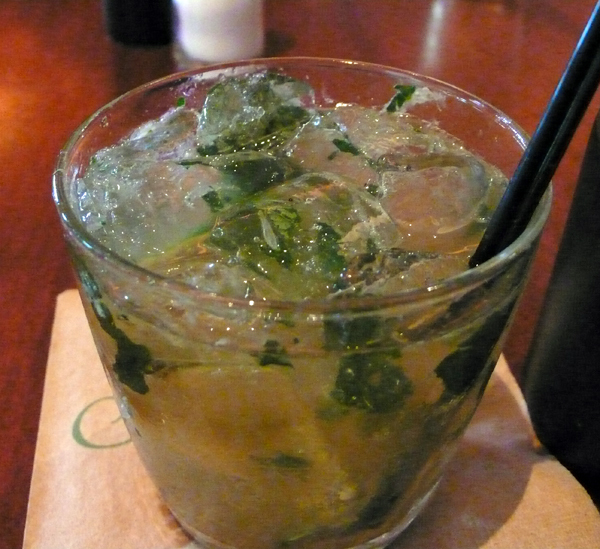 the servers were also unbelievably helpful and friendly. one even mentioned that during breakfast hours, any egg dish can be made vegan by subbing tofu or modifying the ingredients. sweet! 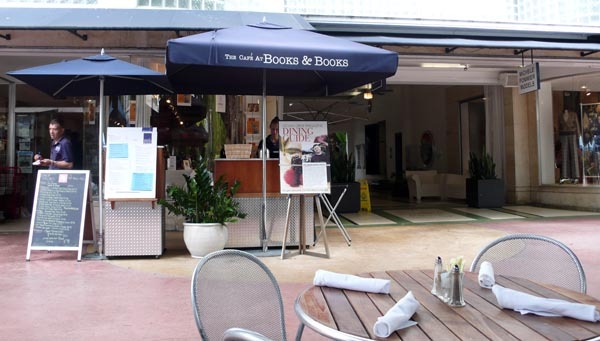 so if you ever head down to miami beach, check out books and books. great atmosphere, super service and a bunch of vegan options. and they do have a lot more than just sandwiches, but lemme tell ya, the sandwiches are damn good!